HAVE YOU EVER LOST A SALE? Every day (in every organisation that sells) someone talks about the sale they lost. However, if they had never owned it – how can they lose it? The sale is never made until it’s paid for. A deposit is not a payment – but a pending down-payment. The only lost sales are those made, contracts exchanged and the payment refunded in full. Invariably the sellers who talk about the sale they “Lost” are usually the ones who sell fewer than 50% of the presentations they make, and are trying to justify their lack of performance. The seller who sells better than 50% knows he or she can use that same amount of energy (others use talking about the one that got away), learning how to ensure they don’t let the prospect get the better of them in future. Think this last point over carefully, and remember that our mouths (in the main) echo our actual results. So what are you bragging about, the ones you got, or the ones you didn’t. Remember, whatever you say is what you get. The subconscious brain cannot tell the difference between the real and the imagined. In time, it accepts all of your negative self-talk as fact, and that’s why so many write the poor results they do. 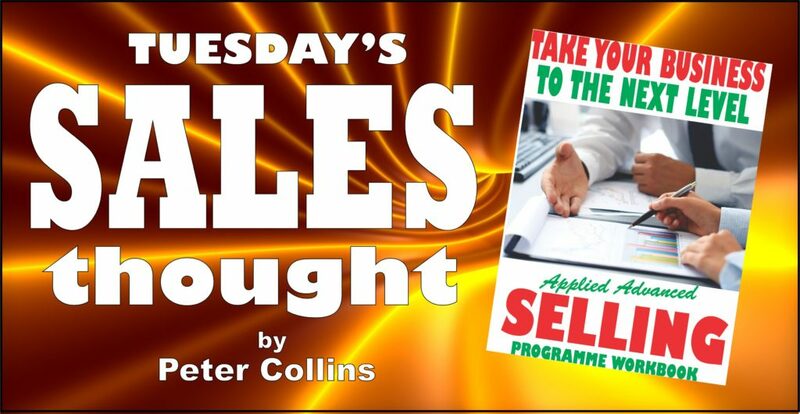 If at the moment you sell less than 50% of your presentations, try telling others of your successes – then, don’t be surprised if you begin to sell more because of it. So don’t use your valuable time and energy bragging about what could have been. You owe yourself more than that. Spend that same amount of time learning how it should be done.